You haven't illustrated any sort of major liberal opposition to this idea, nor have noted why they are. You're just jealous that I know how to make the thread title match the article title. On the other hand, you seem to be pretty giddy about the idea of Trump shipping migrants into the US. Notice there is no reasoned objection to sending illegals to jurisdictions that claim to embrace them with open arms. Democrats claim illegal immigration makes us better in every way except when they become neighbors. Illegal immigrants are already being shipped into cities like Tucson and San Antonio with virtually no screening of their asylum claims or evaluation of their so-called family unit. The proposed policy wouldn't add a single illegal alien to the mix. Instead of targeting these regional cities with a flood of illegals overloading local charities and the public health care system, why not shop them to cities and counties that virtue signal with sanctuary policies? Kindly post with links sanctuary city or county politicians supporting Trump's potential policy of burden sharing. It's easy to tout your own piety as long as others bear the cost of your virtue. No worries. Plenty of liberal sanctuary cities available to house 'em all. Cher suddenly sounds like a Republican. Best way to make libs see how retarded their ideas are is to make 'em abide by 'em. Ya want tons of illegals? Here ya go! President Trump is not planning to ship any illegals into the US. President Trump is suggesting those already here get moved to where they're wanted. I heard Rush talking about asking Democrats to sponsor Illegal Aliens. I'm sure that would go over about the same as asking them to take them into sanctuary cities. 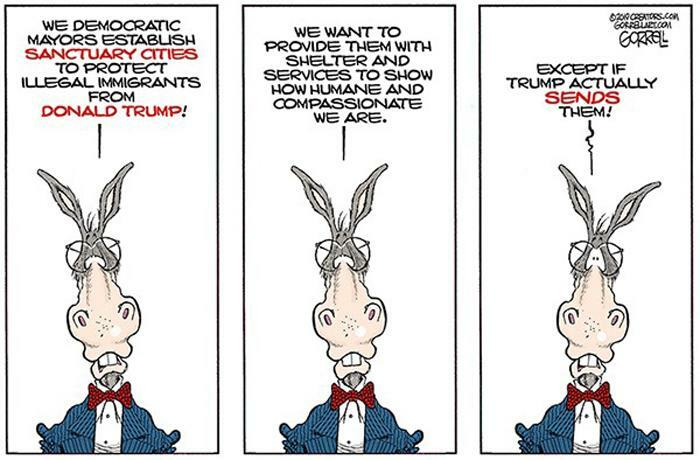 Democrats just want to use illegals for votes and census numbers. Other than that, they could care less. Maybe the best thing is to take a cue from the former POTUS.